Chicken tikka is very popular dish around the world. Like so, chicken tikka masala is my favorite spicy chicken gravy to side with ghee rice and chapati. Though I love to have chicken tikka as its own, in some occasions, gravy plays an important role. For dinner meal, we need some gravy to finish our chapati or any rice recipes. Isn't it? In such cases, I prefer chicken tikka masala which is flavor filled curry recipe. 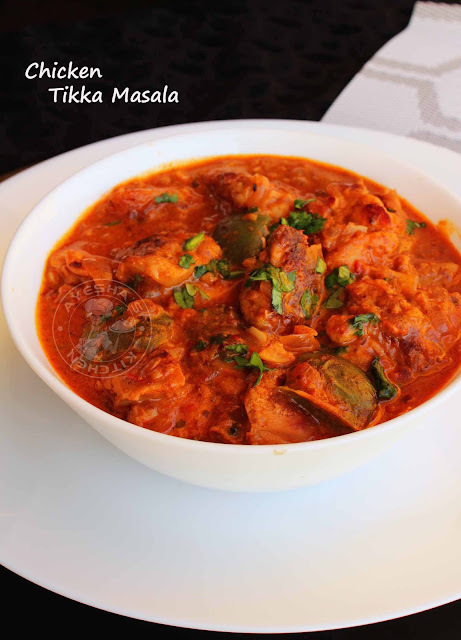 This roasted chunks of chicken tikka in a spicy sauce is not a quick or instant chicken recipe. But it is worth enough. It is among the UK's most popular dishes. 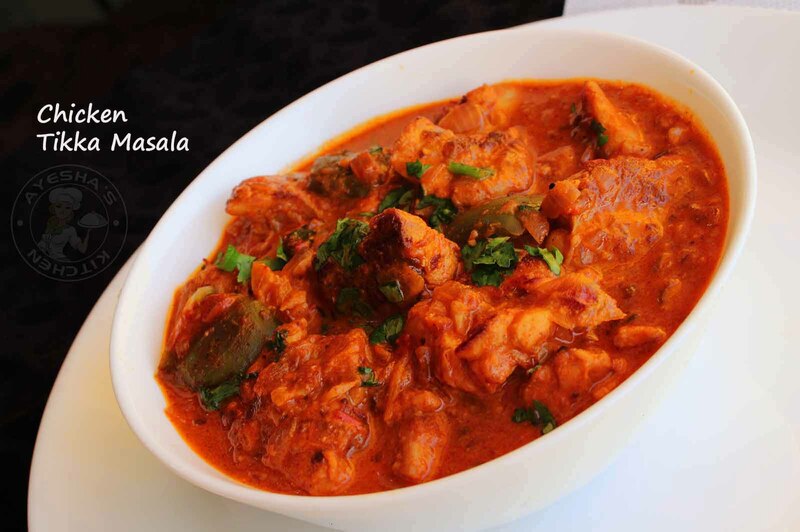 The chicken chunks are baked in a tandoori oven before adding it to the spicy creamy sauce. But here I grilled them on a tawa or non stick pan so that everyone can give this yummy chicken dish a try. Though each recipe varies, this is a quick and simple version for tikka masala. I have tried yet another chicken tikka masala recipe also. Hope I can share the recipe soon with you guys. You can also try paneer tikka masala recipe too. So hope you all guys really enjoyed this spicy chicken tikka masala recipe. Combine together all the ingredients given under 'to marinate chicken ' and marinate the chopped chicken pieces with this marinade well. Keep this overnight, refrigerated. The next day, take out the chicken. Let it comes to room temperature. And then grill in an oven for 20 minutes. Here I grilled on the stove top. So I added a tablespoon of gram flour/besan to the chicken marinade and combine well. Heat a non-stick tawa or pan and grill them until the chicken becomes tender. Set aside. (you can grease the tawa / pan with butter if required). Now heat 2 table spoon of butter in a deep bottomed wok. Add ginger and garlic chopped (or ginger garlic paste ). Saute until the raw smell disappears over a low flame. When done, add the grilled chicken tikka cubes and combine very well. Cook well for 10 minutes over a medium low flame until the chicken is well coated in the gravy. Now add milk and cream mixture (combine well milk and cream in a bowl). Add sugar and check for salt. Simmer for 5 minutes or until a thick consistency.